Thanks to the innovative nanotechnology, the non-stick coating is environmentally friendly, extremely hard and resistant. 5.0mm thickness. Ceramic coating, heat-resistant up to 450°C. 100% free of PTFE/PTFOA. The outside is enamelled porcelain. Non-stick care advice. 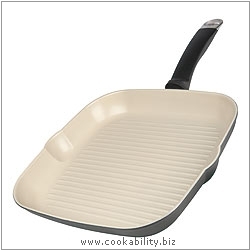 This heavyweight grill pan has an extra thick 6mm ribbed body offering superb performance on induction.